The Buffalo Gal at the farm stand laid out our options for us: t-bones and ribeyes were sold out, so we had to choose between buffalo burgers and buffalo sirloin. In the end, we picked the burgers, since (for one thing) I was concerned about the sirloin being tough. In addition, a 1 1/4 pound sirloin steak rang in at nearly $20, and the same amount of ground water buffalo was “only” $8. We were instructed by the farmers’ market vendor to cook the burgers no more than medium, since water buffalo meat is very lean. This was something of concern in this day of e. coli (hence the NIH’s recommendations to cook ground meat to medium-well or well-done), but since this was local, grass-fed meat it wasn’t too great a worry. The patties were sealed in cryovac packaging and frozen rock-solid. When we got home, I set them in a bowl in the sink and set them under a trickle of barely running cold water–this method guarantees a relatively quick defrost without letting the food spend too much time in the 40-degree-Fahrenheit-plus “danger zone.” It took maybe an hour or 1.5 to fully defrost the patties. Then it was time to grill. Grill! Grill with fire! Rrrr! Since I was grilling (grilling with fire!) 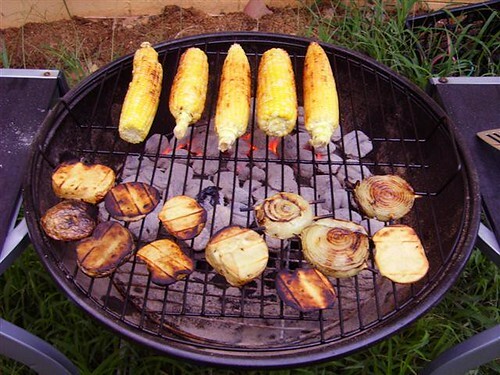 I decided to throw some other stuff on the grill as well: potatoes, corn, onions, and zucchini. As I wanted to have more control over the burgers’ cooking, I decided to cook everything else first, saving the burgers for when the coals were a little cooler. The onions and potatoes went on first, since they took a little longer to cook. One problem here was that a lot of the oil I had tossed the veggies in dripped onto the coals, which covered some of the onions and potatoes with soot. Beside that, these came out pretty well (though some of the thinner slices of potato got a bit dark). 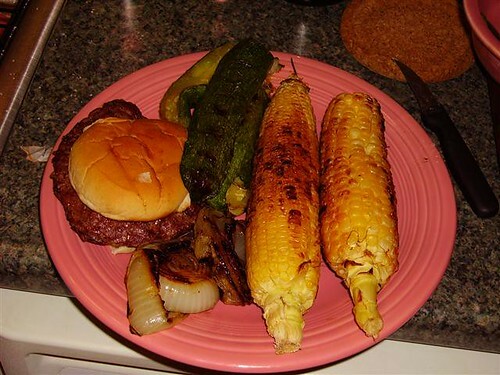 After they sat on the grill for a while, I moved them to the cooler side of the two-level fire and threw the corn on. The corn got very good color, but the kernels shriveled a bit. The quick-cooking zucchini went on last, though in my impatience I did not give the grill time to recover before adding the zucchini, so it didn’t get a very good sear. At long last it was time to put the burgers on. 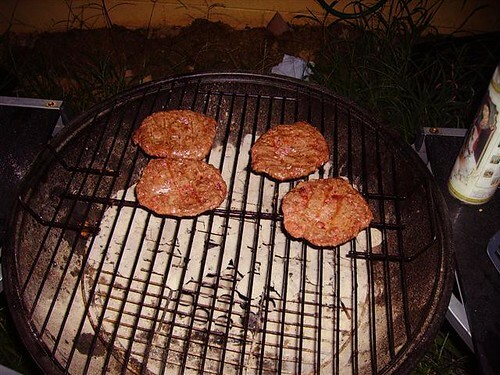 By this time the coals were a little burned down, and the combination of this, the extraordinary leanness of the buffalo meat, and my bargain-basement grill with its bargain-basement grate, made it difficult to get good color on the burgers. They cooked to medium rare pretty quickly, and despite their pallor they smelled pretty good. Of course, the burgers had a diameter easily twice that of the buns I had on hand, but somehow we managed to deal with it. I decided to give my burger minimal seasoning — just a touch of mayonnaise for richness — and we sat down to enjoy dinner. As mentioned above, some of the potatoes and onions were a little sooty, but they came out well overall. Likewise, the corn was a little dry, but a brine should fix that problem next time — I will cover brines on a future installment of this page. The zucchini, which I had purged per the method presented here earlier, remained a bit wet — in this case I think that it may be better to keep the moisture in the vegetables rather than bringing it to the surface. The consensus on the water buffalo burgers was that, while it had a pretty standard red-meat flavor, it was not particularly distinct — if one could imagine “generic red meat flavor,” with the tiniest dash of gaminess, this would be an apt description. 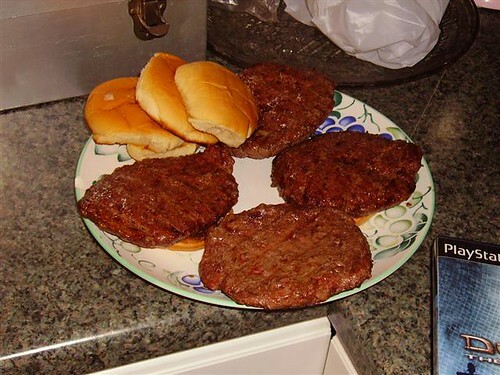 In addition, the burgers were a little dry due to the lack of fat in the water buffalo meat. If I could do it over again, I think I would form the burgers into thicker patties, rather than going with the pre-formed extra-wide patties that the Buffalo Gal had provided. This would help to keep some of the moisture in the meat and also allow for somewhat more aggressive cooking; pre-seasoning might also help, but the addition of salt to the burgers might drive moisture out, and anything else might interfere with the extremely subtle flavor of the meat. While there were certainly areas in which this meal could have been improved, I think I’ve managed to identify the places where things went wrong. I’d love to have the budget to experiment with water buffalo meat more, and perhaps to try the steaks, but I’d have to sell the cats into slavery to consider this. Overall, I’m glad to have had the chance to experiment with water buffalo, but I can’t see it happening again any time soon…unless of course the kind benefactor who will eventually be sending me that KitchenAid food processor also wants to set me up with a meat per diem. Ahem. Next > (Bad) Technique: Misadventures in saucing! Ever considered grilling your corn with the husks on? Yes, but then it doesn’t get all caramelized and delicious. Frankly, I just don’t think it adds that much to cook it with the husks on, because the corn never really gets to experience the smoky goodness. Also, in this case, three of our five ears came with some not insignificant bug damage that wasn’t apparent until they were husked. I’m not too picky about that stuff, but one of the husks actually came with a Little Larval Friend who probably would not have been too tasty grilled.